International sanctions against North Korea for eliminating its nuclear and missile programs should not be an end in itself, but the means to force the regime to comply with the global nonproliferation regime, said a senior European Union official during an official visit to Korea last week. “The EU strongly supports the complete, verifiable and irreversible denuclearization of the Korean Peninsula. All our efforts will continue to be targeted at achieving this goal,” said Schmid in Seoul. In late February, the EU adopted additional restrictive measures against North Korea by incorporating into its laws the measures imposed by the UN Security Council resolution 2397, the latest sanctions last year. The measures include strengthening the export ban to North Korea of all refined petroleum products; a ban on imports from North Korea of food and agricultural products, machinery, electrical equipment, earth and stone and wood; a ban on exports to North Korea of all industrial machinery, transportation vehicles, and expansion to all iron, steel and other metals; further restrictive maritime measures against North Korean vessels; and the requirement to repatriate all North Korean workers abroad within 24 months from February. 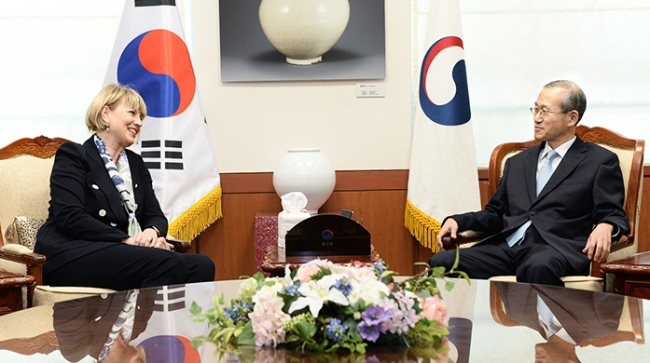 On March 26 in Seoul, Schmid met with South Korea Foreign Minister Kang Kyung-wha, Vice Foreign Minister Lim Sung-nam and Lee Do-hoon, special representative for Korean Peninsula peace and security affairs, who is the country’s top negotiator on North Korea. The meeting came as Seoul prepares for a historic third summit with Pyongyang to discuss the latter’s denuclearization in the truce village of Panmunjeom on April 27. North Korean leader Kim Jong-un and United States President Donald Trump are scheduled to hold a summit before the end of May. Schmid’s visit came one week after Kang’s talks in Brussels on March 19 with EU high representative for foreign affairs and security policy, Federica Mogherini, and her discussions with EU Foreign Ministers on the planned inter-Korean summit. “The EU can support South Korea in the denuclearization diplomacy, using the expertise from the Iran nuclear deal,” Reiterer told The Korea Herald last week, referring to the Joint Comprehensive Plan of Action. The historic nuclear accord was reached in Vienna on July 14, 2015 between Iran, China, France, Russia, the United Kingdom, the United States, Germany and the EU to put a cap on Tehran’s nuclear program.